Improved quality, reduced cost, better teamwork, faster response to customer needs – there are as many reasons for practicing kaizen as there are tools, templates and skills to help you do so. But ultimately we practice kaizen because it helps you to learn and to live a better life. The first step in changing the reality around us starts within us with what Taiichi Ohno called “a revolution of awareness.” This is more than simply attending a seminar and flipping the switch from “ignorant of kaizen” to “aware of kaizen” – it is a daily practice of becoming conscious of the flow around you. I recently read a fascinating book titled The User Illusion: Cutting Consciousness Down to Size by Tor Norretranders, about human consciousness. There are some truly revolutionary ideas contained in the book, not all of which I’ve figured out how to put into daily practice. For example, the book reveals that the expensive part of knowledge is not gaining new information but getting rid of the old information. Another is that consciousness lags at least 0.5 seconds behind decisions that our brains take to action or not to, implying that free will of “I” as the decider is an illusion. One fact particularly relevant to practicing kaizen is that the brain receives about 11 million bits of information per second (11mbps) from sensory sources but conscious thought can handle no more than 40 bits per second. What we call consciousness, what we are “aware” of, is only 0.00036% of the sensory input we receive. That is almost as good as the process cycle efficiency (PCE) – the value added percentage of work done in the value streams of most companies before implementing lean management practices. It’s a small number. The book provides biological developmental context in terms of survival for limiting the sensory input we are aware of to no more than 40 bps. Doubling that number would presumably not yield great benefits, only information overload. The book suggests that 40 bits per second is the maximum amount of input we can process, and that people get by on much less. If a good goal for PCE for manufacturing companies aiming to become lean is 5%, a similar goal for people who want to become leaders through kaizen would be to top out their perceptiveness and awareness at 40bps. Many of us get by on much less, as evidenced by the number of times people will walk by a piece of trash on the floor without picking it up, observe a minor safety violation but do nothing, see dull and repetitive work being performed by humans with nearly limitless creative potential and yet be satisfied to let them toil at their labors. In order to shift your awareness you need to stimulate your senses by changing the inputs. Change the scenery by looking at your work, your business or the performance of your team from the outside in. This may require going to see and benchmark what others are doing. Within your own sphere of interest, identify where you add value (gemba), and go to the gemba. Go see what is actually happening at the customer site, observe the user experience, visit the crew working in the field, stand in the circle, commit to a routine of genchi genbutsu – going to see the facts for yourself. Silence is important when creating a kaizen consciousness. We go see in order to learn. We need to be still and let our senses absorb the 11mbps sensory input while we focus on the 40bps. It seems to be in the nature of people a social animals to want to begin talking and sharing with each other what they are observing when they go to the gemba. Whenever we introduce the stand in the circle exercise there are people who crowd the 40bps of input with their own voice. Our voice keeps us attached to what we think or wish to think we are seeing. The way to make a shift in awareness is to do our best to perceive things simply as they are. 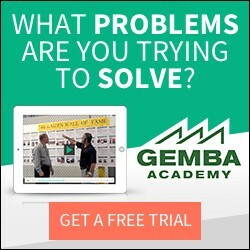 The gemba will teach you many things if you can be silent. Becoming aware of minor abnormal conditions and taking the time to restore them to normal conditions is the absolute minimum price of entry for building kaizen consciousness. The smallest non-conformity, violation of agreement, unsafe condition should not be overlooked or left as is. The nature of human consciousness is to ignore much of the 11 million bits per second of input that our subconscious deems unimportant to getting us through our day. Unless we train ourselves to notice and be bothered by the small abnormal conditions and take the time to correct these small flaws in our lives and in the systems around us, we will develop neither the eyes to clearly see nor the skills to fix our bigger problems. If there is one thing we should all do in 2009 to boost our kaizen consciousness it is to create one standard and follow it. Ideally this standard is a result of a correction of a minor flaw, something as easy to sustain as switching the lights off when we leave a room to reduce wasted energy. Advanced problem solving would result in lights that shut off automatically using a timer, motion sensors, RFID or a key. In this example the important foundation in building a kaizen consciousness is to set a standard that “lights left on” is a minor abnormal condition which now bothers us every time we see it, and therefore we train ourselves to change this behavior. These small kaizens which become documented standards, are practiced daily and are gradually copied across en entire office, building or enterprise can have very large impact both in terms of direct cost savings and culture. At the individual level, even just one such success begets confidence in finding other abnormalities and restoring them to their normal conditions. At a general level the entire focus of kaizen is to get rid of waste, reduce variation and eliminate overburden. Systems and methodologies to redesign and manage all sorts of processes have evolved over the decades with these aims in mind, and these as a whole are called “lean management” or simply “lean”. We all need to do much more to boost our personal awareness of waste. Pick up a pencil and paper. Write down the 7 types of waste. Give one example of each. It is surprising how many people who have years of practice in coordinating, managing or leading lean manufacturing cannot complete this exercise. Their kaizen consciousness is weak. Waste is such an obvious and ubiquitous concept that we ignore 10,999,960 bits per second of input on waste in our daily lives. At a personal level, notice how much waste we create. Each day how many things do we throw away? And where is “away” by the way? It is just another purely non value adding process called disposal that we pay for. How much electronic business input do we take the time to receive, sort and discard or ignore? What time, attention, water, fuel or life energy do we consume without apparent meaningful output. This is heavy stuff if we think about it too much, but doing so even for a few hours a week is sure to books your kaizen consciousness. Looking forward to seeing you on the gemba in 2009. Excellent input to create awareness about Kaizen.I am planning to share your views with our Cross Functional Project Team members through a presentation tomorrow in our weekly meeting. Keep the lean learning going. LSS Academy is now on Twitter! The Kaizen Blitz!